Unfortunately, the community will be forced to pay for these projects, whether they want them or not, without any consultation or serious consideration of alternatives such as [[Water tanks|domestic water tanks]]. Unfortunately, the community will be forced to pay for these projects, whether they want them or not, without any consultation or serious consideration of alternatives such as [[Water tanks|domestic water tanks]]. + It appears that the Brumby Government is prepared to write of constituents in rural areas such as Yea and the Goulburn river catchment in an attempt to find more water for Melbourne. However, the water the pipeline will actually deliver is questionable. Federal Environment Minister Peter Garrett has given the project a green light and endorsed it. 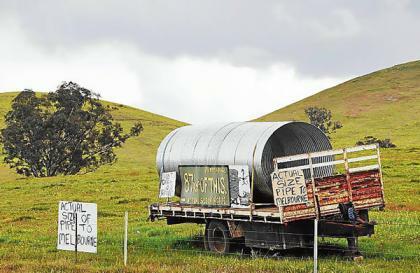 + The only year the pipeline is expected to achieve its goal of delivering 75 billion litres to Melbourne is 2010, the same year the Brumby Government will seek re-election, because that water has already been saved by other irrigation upgrades. But from 2011 onwards the officials expect flows to fall significantly as the pipeline will rely solely upon savings in the foodbowl district. + On 22 April 2009, a consultant's report was published that cited lower-than-expected flows down the pipeline as a major reason behind a predicted 159 billion-litre fall in available drinking water supplies over the next four years. The shortfall is equivalent to about six months' typical consumption in Melbourne. The report has cast fresh doubts on the $600 million-plus pipeline's ability to alleviate shortages. This page has been accessed 117,855 times.